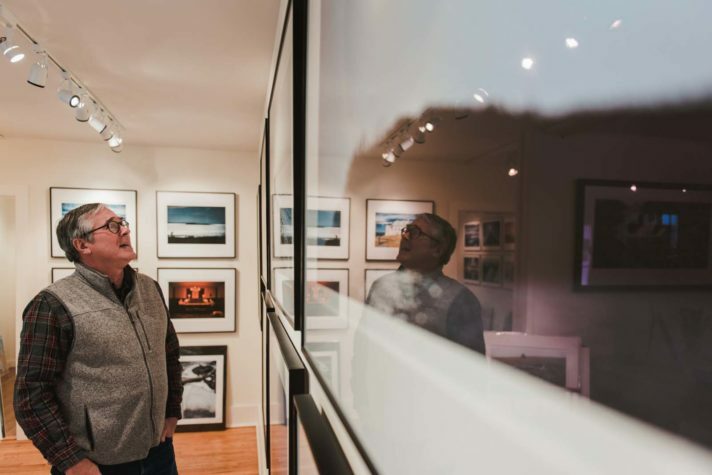 Maine scenes, both grand and intimate, are the subjects of Peter Ralston’s framed photographs on display at the Ralston Gallery in Rockport. Ralston looks out at downtown Rockport from the vestibule of the gallery. Ralston’s photograph, “That Hour” (on the floor at right), echoes the Andrew Wyeth painting to its left, titled Witching Hour. Ralston shot the portrait of Andrew Wyeth, titled “In His Eyes,” for the cover of Wyeth’s authorized biography, Secret Life. 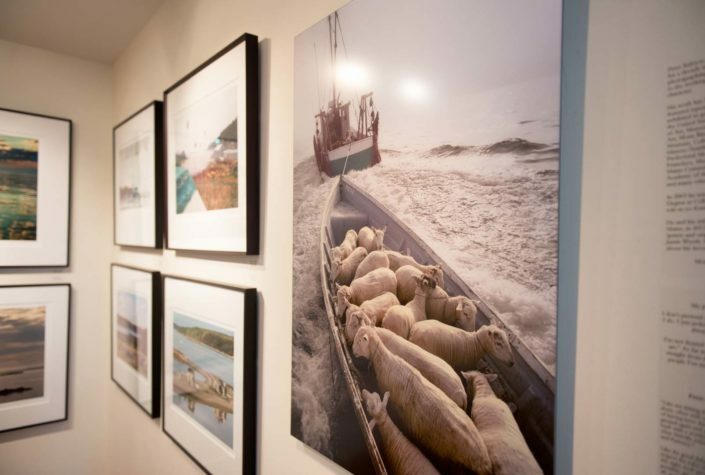 Ralston chose to open his gallery in Rockport instead of busier Rockland or Camden because it’s close to his home and his boat. “Enough people find us; some stumble across us and some know my work and come looking for us,” he says. 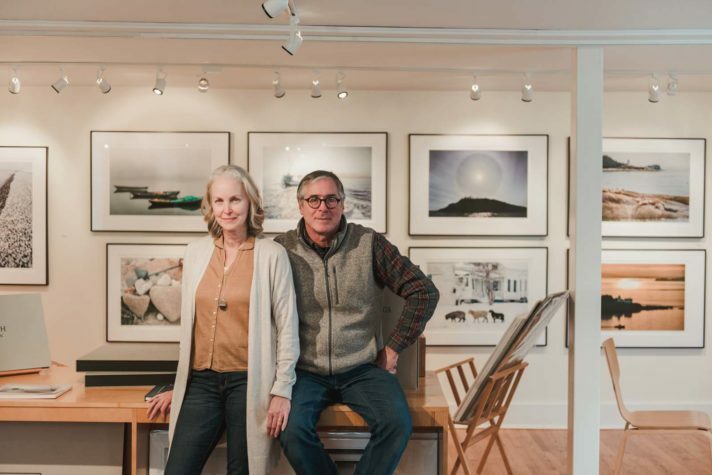 Ralston and his wife, Terri Harper Ralston, who works with him at the gallery. Luck comes up a lot in our rambling, occasionally intense conversation, as does Ralston’s comparison of himself to Forrest Gump. There is an element of “right place, right time” in his life’s fascinating trajectory, but also raw ambition, grit, and a willingness to see and seize opportunities. 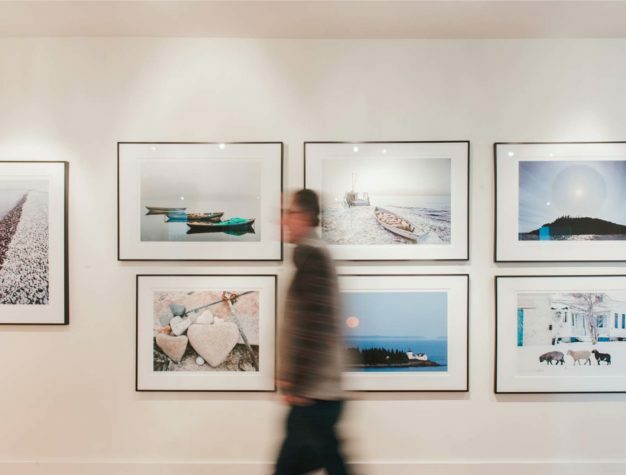 Making photographs has been Ralston’s life’s work, and while he detests the term “fine art photography,” his native talent was nurtured and inspired by the first family of American art. 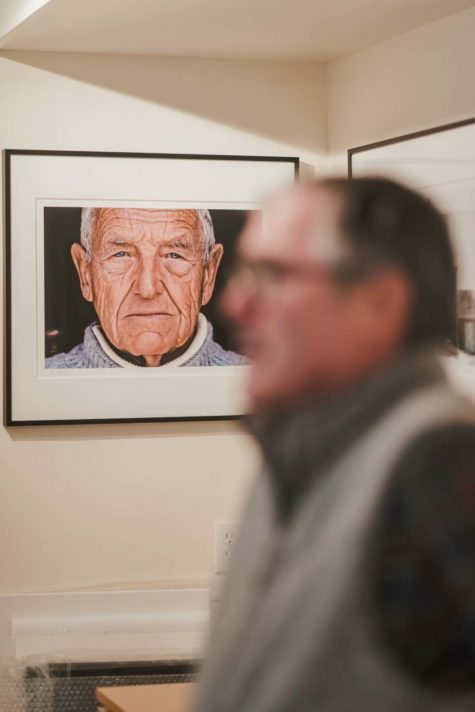 Ralston Gallery is as much about the Wyeths, particularly Andrew, who died in 2009, and his 97-year- old wife Betsy, as it is about the photographer whose name is over the door. Here is Ralston’s intense portrait of Andrew, titled “In His Eyes,” made for the cover of Wyeth’s authorized biography, Secret Life. 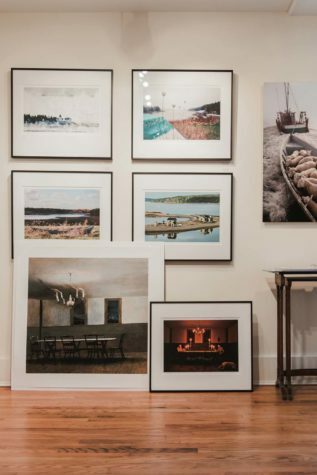 There is a portrait of Betsy all in white, looking patrician and completely at ease, draped into a chair in the white- painted bell tower of the lighthouse on Southern Island, the first Maine island she purchased, and where artist son Jamie now spends summers. The photograph is titled “Keeper.” I am drawn to “That Hour,” which shows Andrew and Betsy in a room with a high chair rail and two windows, seated at either end of a long farm table lit with tall candles. A candlelit chandelier hangs overhead, and their large white dog is asleep on the wide board floor in the foreground. Betsy looks amused, one hand on her fork and the other on her hip, while Andrew is laughing, open-mouthed, as he pours wine into a glass. In typical Ralston fashion, we have circled back to the story of the photograph I admired. The old schoolhouse became the Wyeth’s dining room, and Ralston’s image recalls one of Andrew’s paintings titled Witching Hour. In it, the room is empty and slightly tilted, the table unoccupied. A gust of wind is blowing through, extinguishing the candles in the chandelier, and trees outside the windows are black against a brooding sky. “It’s really a portrait of their marriage,” says Ralston of the painting. “Betsy is every bit Andy’s equal—brilliant, tough, headstrong, willful… they really loved each other, but they could get into it.” The night he took the photograph, the three of them were having dinner together. “We were all having a jolly night, and I said, ‘I’ve got a tripod, how about we do a picture?’ This will be “Happy Hour,” not Witching Hour. Ralston Gallery is also a source for limited-edition prints by Andrew and Jamie Wyeth, as well as access to original work by all three generations of Wyeths, including N.C. For high-level photography collectors, the gallery offers limited edition-prints, presented in linen-covered museum-quality boxes, a sample of which are displayed in the center of the modestly sized space. These include “Pairings,” 20 poems by Conkling paired with 13” by 19” inch prints by Ralston. “I had always wanted to do a book with Philip’s poems and my images, but with publishing now, you’re always doing battle with the accountants,” says Ralston. 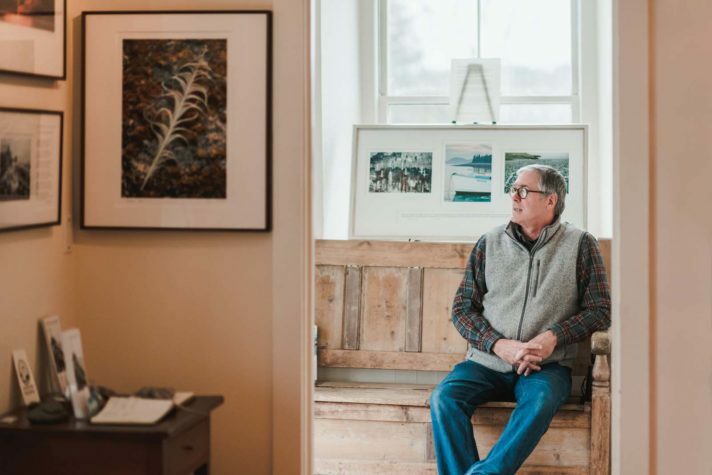 “We wanted something of real excellence, so Terri said, ‘Do it on your own.’” Portland printmaker David Wolfe did the letterpress work and the folio’s thick, beautiful paper came from England and France. “We had so much fun putting this together, because we didn’t have to cut any corners,” Ralston says.